It gives me great pleasure to welcome you to the website of Dr. B.M.N. College of Home Science. This site will introduce you to various facets of our institution, particularly our unique student support services and as well as the exciting range of activities that we organize to promote the all-round development of our students. Greetings and hearty congratulations to my dear faculty, non-teaching staff and students! The academic year 2018-2019 began with the exciting announcement that Dr. B.M.N College has been awarded with the status of ‘College with Potential with Excellence’ from the University Grants Commission, New Delhi (UGC). There were only 8 colleges that received this award in Mumbai in this round of selection, and we are proud to be included in this exclusive list. We are looking forward to improving our infrastructure and teaching-learning-evaluation strategies through the grant of Rs. 1.5 crore which the college will receive. 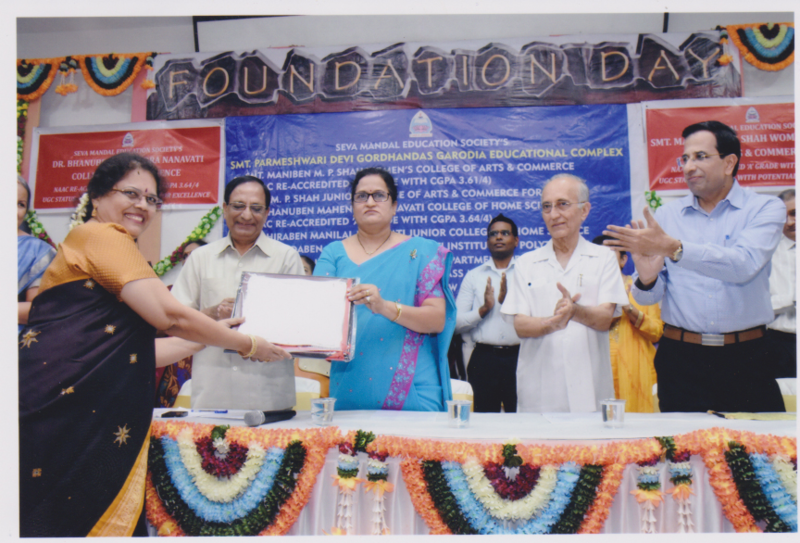 We were privileged to have our honorable Vice-chancellor Dr. Shashikala Wanjari at the Foundation Day celebrations wherein our Management felicitated the college for attaining this significant milestone. It wouldn’t have been possible without the support of management members. In 2015-2016, our parent body SMES received a generous grant of Rs 22 lakhs from SAS Institute [India] Pvt. Ltd towards converting existing classrooms to SMART technology enabled classrooms under their CSR (Corporate Social Responsibility) initiative. This year SMES received an additional grant of Rs 31 lakhs. The college level CSR committee has worked hard towards conducting training programs for both teachers and students, and we are confident that the use of SMART Technology will enhance our teaching-learning processes. An important outcome of social outreach programs is the transfer of knowledge from lab to land. In this context, we are happy to share two MOUs executed for the purpose of social consultancy. Special congratulations to Dr. Rupali Sengupta who lead a project on ‘Nutritional Consultancy: Enhancing Wellness through Anthropometric Measurements and Counselling (Dietary recall) and Demonstrations (Modified Food Products). A step to prevent future lifestyle diseases in school going children for the year 2016-2017’; and to Ms. Roma Gandhi who will be coordinating a project on “Ergonomic Studies of 10 Spindle Charkha developed by Udyog Bharti, Gondal, Dist. Surat of Gujarat State under Khadi & Village industries Commission (KVIC)”. Our special kudos to Mr. Nitin Pawar, NSS Program officer for receiving a certificate of appreciation from Government of Maharashtra, for his involvement in a wide range of social outreach projects. We have had an eventful year with a number of achievements on the part of staff and students. I congratulate all of you for making the year a successful one. Our students brought laurels through their performances in the dance, literary and theatre events at the SNDT Yuva Mahotsav. Students of the B.C.A, M.Sc and Beauty Culture programs have appeared on the merit list of their respective courses. 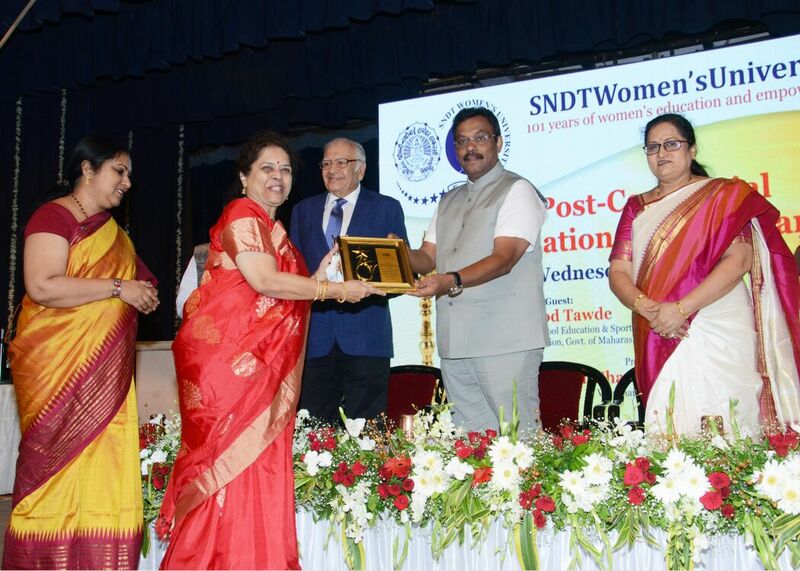 We received a trophy from SNDTWU for maximum participation in sports events. An important mile stone is the incubation centre (Guru Gyan) initiated by the M.Sc CND for mentoring students in research and entrepreneurship. We are proud of our students of M.Sc CND for maximum innovative ideas at the ‘IPL Avishkar’ competition The M.Sc Department of Clinical Nutrition and Dietetics, and the Department of Food Science and Nutrition continued to coordinate with AFSTI to conduct to Nutrition Awareness activities including Nutrition week and health related events on the occasion of Women’s Day. The Gandhian Studies Centre organized a seminar on 3rd Feb. 2017 in keeping with theme for the year on “Good Citizenship”. Our NSS unit has strengthened its community outreach projects with the support of the Inner Wheel Club of Bombay downtown, the Rotary Club of Bombay Uptown and the Lions Club of Sion. The ‘Bal Mela’ of the Human Development proved to be one of the most popular events of the year. Tekzone and Akanksha intercollegiate festivals continued to draw out the creative talents of students from colleges across Mumbai. The restaurant set-up of the Dept. of Resource Management was a resounding success and I compliment the entire team. Faculty and students of TSAD have participated in social outreach programs for marginalized women organized in collaboration with ICT. On March 8th, we celebrated International Women’s day in the august presence of Madam Amruta Fadnavis and senior women administrators of our institutions were felicitated as ‘Women Achievers’. I wish to congratulate all the committees for the success with which they have conducted academic, cultural, NSS, Sports, Alumni and PTA events. The non-teaching staff continues to actively participate at intercollegiate sports events. None of these endeavors would be possible without the involvement of the SMES Management and I thank our Management members for their encouragement and motivation in all that we do. I sincerely thank the sponsors and philanthropists for their support for student freeships, infrastructure development, and sponsorship of vacation classes. Special thanks to Lions’ Club of Sion, Rotary Club of Bombay Uptown, Rotary Club of Worli and Inner Wheel Club of Downtown for their continued collaboration in important health and other ventures. Heartiest congratulation to my dear teachers, non-teaching and students for excellent team work. We have received A+ with CGPA of 3.69 / 4 in third cycle of NAAC Re-accrediation,we have stood 3rd out of 116 institution at all India level in this particular cycle of Re-accrediation. Having taken a cyber-tour of our institution, we invite you to visit our institution in person. 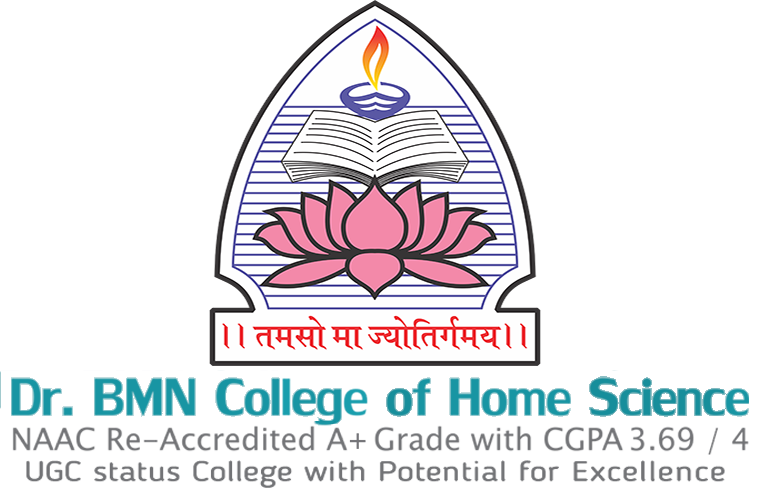 Congratulations to Dr. BMN College of Home Science for receiving UGC Status – ‘College with Potential For Excellence’.